Where is the “dislike” button? What a bunch of crap, would love to catch the hole digger then make them dig a hole big enough for them! wtf? Severe case of seasonal depression? Why would somebody hate cyclists in Ash Canyon? i could wait a LONG time to catch someone pulling that b.s. Seems hard to believe that much digging was done and NOBODY saw them??? I know someone that saw two people with shovels. I’ve sent an email to get more info. 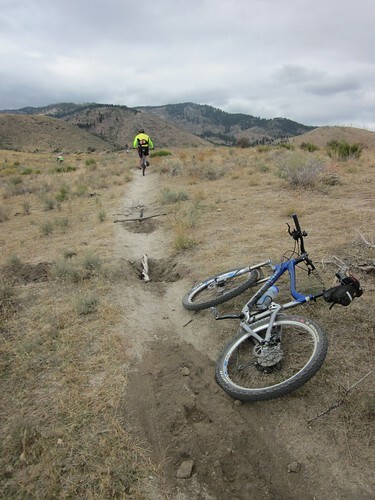 On a good note, Parks and Recreation and WNC have offered to help fix the trails if we need assistance! What an awesome community. Same kind of spineless, dickless, Trolls that shoot defenseless horses. Somehow… I am not surprise by the level of assholeness that some people show…. I hate violence…. however, taking into account the fact that the real intent of whoever is doing this is to injure someone…. I would say that the people doing it deserve a good beating…. Somehow, I hope to catch them… even if just to smack them…..
Wow… now that is seriously f’d up!!! Been riding out there a bit after work so I will definitely keep my eye out and considering those are the trails I ride most.. Wonder if there is some kind of dispute going on between riders and hikers because in the last couple weeks I have seen a lot of arrows painted on the ground as though there were unsanctioned races going on. The arrows painted on the ground are for the CMS XC team’s training runs. The coach is the one who sent out the initial warning this AM. 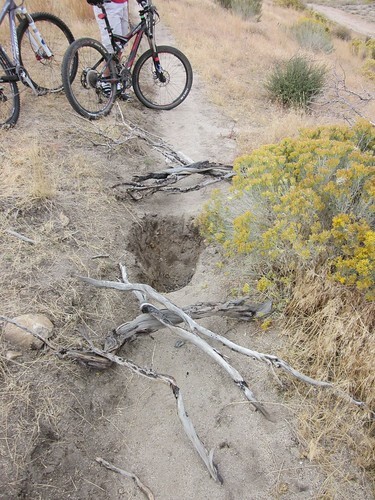 That said, it’s a good possibility that a hiker or horse rider may have had a bad run in with a cyclist and thought this would be a good solution. 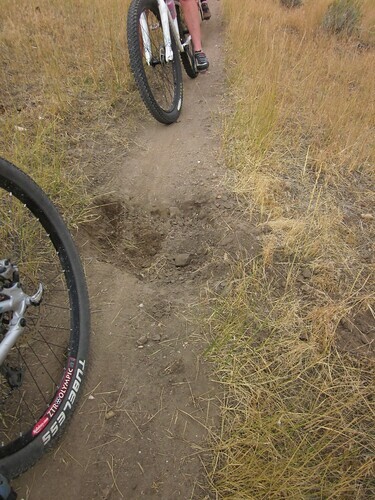 Perhaps someone needs to be reminded that these trails were built and are being maintained by cyclists. Jeff Resler went up and filled in the holes! No guarantees that more won’t be dug though. Be on the watch. Jeff Resler also removed the latest log on the Creek Trail, and Scott and Lester took care of the one that fell last week. Thanks for everyone’s quick response! I walked back via Steps and Vicee and that route is clear as well. Was today’s tree a fall or was it dragged across the trail? Good to hear those 2 trails were clear! We didn’t have time to ride those. The tree on the creek was huge…Mother Nature. I rode Ash today at about 4. 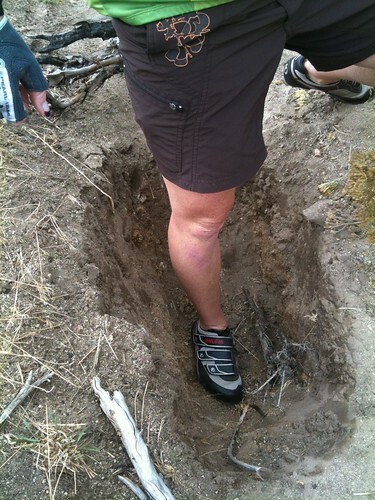 Saw a kind fellow out there with a wheelbarrow and shovel right as we were coming down that last awesome section. You saved our asses sir. Regards. Trails were in great shape today! Excellent repair job! Unfortunately there are some people out there with some very serious issues. Obviously whoever did this is mentally irregular. Too bad nobody could catch the rascal (s). I’m happy to hear that no one was seriously hurt and I also hope the A hole who did this chokes on their next meal.